Over 200 people rallied at the Vancouver Art Gallery on Tuesday, Aug. 30, 2011, to raise awareness about the threats faced by wild salmon populations. 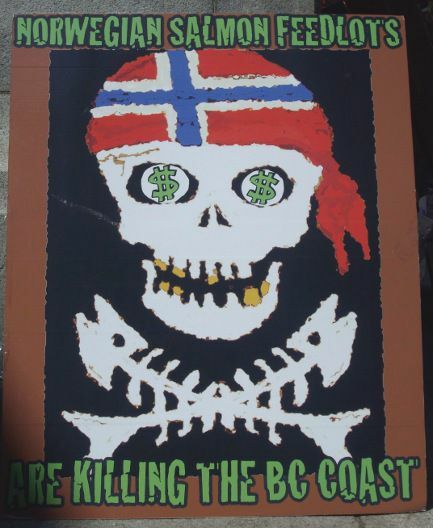 These include industrial logging and commercial fishing, pollution, and the proliferation of fish farms on the BC coast. But at this single-issue style rally/media event, fish farms were the main target. 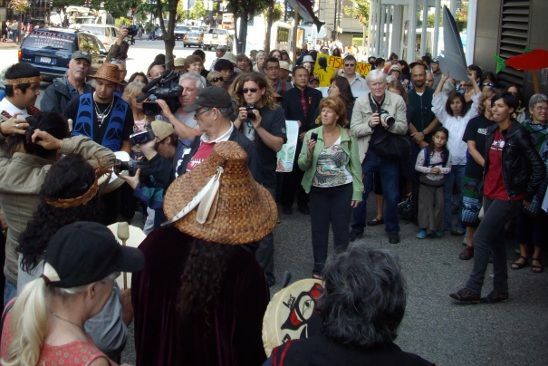 In fact, the rally was timed to coincide with the federal Cohen commission into the collapse of the Fraser River sockeye salmon. 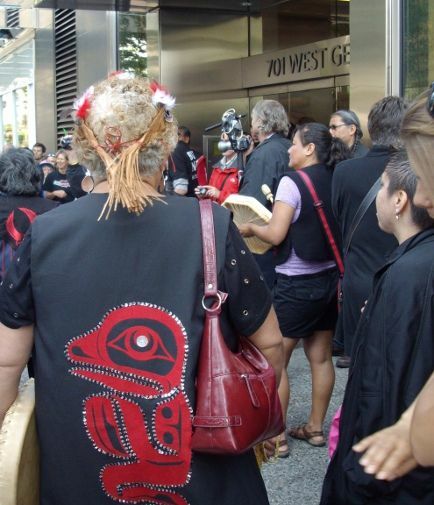 It is named after Bruce Cohen, a BC Supreme Court judge overseeing the hearings. The commission began on August 22 and continues to September 8 at 701 W. Georgia Street (at Granville). The commission is open to the public and is hearing testimony on the theme of aquaculture, and in particular fish farms and the spread of disease among wild salmon. There are over 100 fish farms operating on the coast, most located on the west coast of Vancouver Island and the north-east inside passage between the island and the mainland (Broughton Archipelago). Opponents assert that fish farms endanger wild salmon populations through infestations of sea lice and viruses carried by farmed salmon, the large accumulation of toxic waste produced by fish farms, and the introduction of farmed Atlantic salmon into the habitat of wild salmon. According to the Sierra Club of BC, the waste produced by fish farms on the coast is the equivalent to that produced by a city with more than 500,000 inhabitants (comprised of fish feces, blood, chemical waste, uneaten food, and dissolved metabolites). The Department of Fisheries and Oceans (DFO) reports that between 1987 and 2002, more than 1.4 million salmon escaped from fish farms. 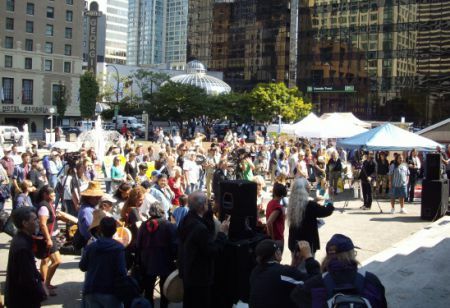 Speakers such as Alexandra Morton (a North Vancouver Island-based researcher and activist), executives from the Union of BC Indian Chiefs, band council chief Marilyn Baptiste (Xeni Gwet'in First Nation), and members of the Kwicksutaineuk First Nation, addressed the crowd. 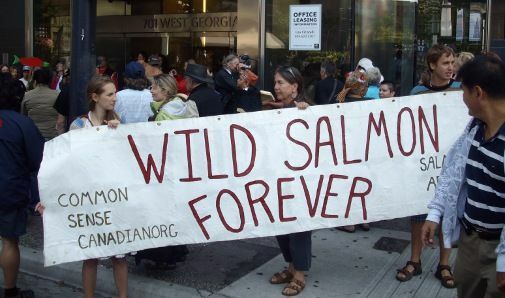 Their main message was that the very survival of wild salmon in BC was at stake and that people should write to their members of parliament (with some advocating land-based fish farms as an alternative). 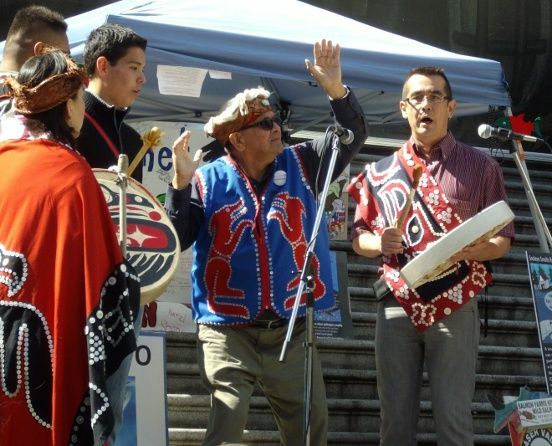 Along with the speakers were a number of cultural performances by the Kwicksutaineuk delegation and several Coast Salish members, including the Salmon Dance. Thanks Gord. It's great to read about this! The loss of our wild salmon is such a grave and urgent issue, yet it seems that the powers that be invest a lot into shushing it up. I would love to follow what is happening at the Cohen Commission. Please, more articles! Thanks for covering this. Often, fish farming is put forward as some sort of solution to overfishing, and choosing to eat farmed salmon is framed as the moral thing to do. It's inspiring to see people who deeply appreciate wild salmon throwing away these flimsy justifications.